Archaeologists have been rapidly integrating new media technologies into their interpretive schemes through a variety of methods. Virtual worlds, social networking websites, blogs, wikis, and digital photo mash-ups are becoming legitimate alternate ways to present archaeological information. The greater availability of inexpensive equipment and software that is powerful and easy to use has provided a lower entry point for remixing photography, film, and databases into multimodal presentations and increased the potential for archaeologists to use these media to tell their own stories. This, combined with the growing ubiquity of online, collaborative media platforms has allowed us to reach out to new audiences by integrating archaeology into a greater social sphere. Archaeologists have built too many technological islands in the form of isolated websites, soon abandoned after the project ends. While new media technologies do provide a venue for ongoing dialogue in a broader public context, what are the implications of this for archaeology? In a conference that is fully engaged with questions regarding the future of archaeology, this session explores interpretive projects inspired by new media art and technology. In this exploration we will discuss alternate narratives, collective actions and what it means to be an archaeologist in the digital age. Alternate forms of papers and presentations such as films or websites are welcome. My entry was typeset by my friend Jesse, who does great design work. It’s attached here, and you can see all of the other papers that are in the session. Editing will get less excruciating someday, right? Right? I love the Sci-Fi imagery. What is an Archaeological Photograph? Several of my fellow archaeology graduate students are also skilled photographers, and we’ve gone out on photo-taking expeditions together, usually to places that yield a certain amount of gorgeous decay. I do not consider myself to be a photographer of any skill–my practice in this regard is just snapping things that I think are interesting–but I find the concept of the archaeological eye and the creation of archaeological media objects fascinating. So what makes a photograph archaeological? Since we’re trained archaeologists, does this change our photography? There’s some discussion of professional vision in more formal venues, and my “elder brother” in the program (a past student of my advisor) based his dissertation around this question. Still, I’m not sure that the question has been answered to my satisfaction. Do you think your photography is affected by your work in archaeology? Can you walk me through your practice? How many photos do you usually take? How many of these do you upload to flickr? How do you decide which to upload? Any other questions I should ask? Author colleenmorganPosted on March 26, 2008 March 26, 2008 Categories Archaeology, Art, new media, photography, social networkingTags Archaeology, flickr, photography12 Comments on What is an Archaeological Photograph? 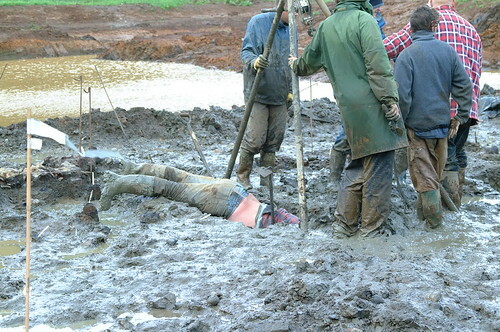 From alverstonedig, a muddy dig on the Isle of Wight. They found well preserved Iron Age timbers (with visible axe-marks), a Roman causeway and–this kills me–a hazel leaf, pressed into the bog. From shovelingtom, a project in Sudan, where there are gorgeous vistas and interesting rock art. I like his photos of the surrounding community as well. 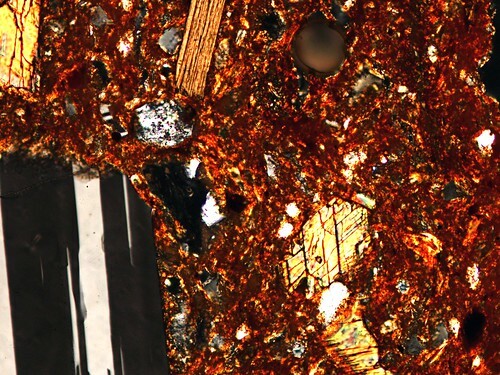 Finally, a photo of a ceramic thin section from a fellow Berkeley PhD student, Andy Roddick. If you click on the photo, he identifies some of the various minerals with notes. I love this aspect of flickr–annotating photos to provide explanations guided by professional vision adds so much to presenting archaeology to the public. And for that matter, to other archaeologists–I surely didn’t know what a biotite looked like!